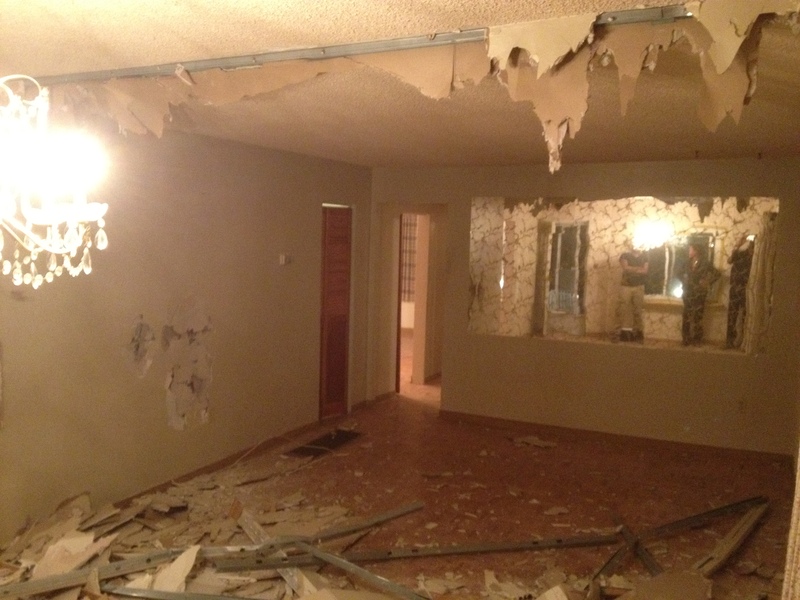 The demo crew has been VERY busy while we were away. 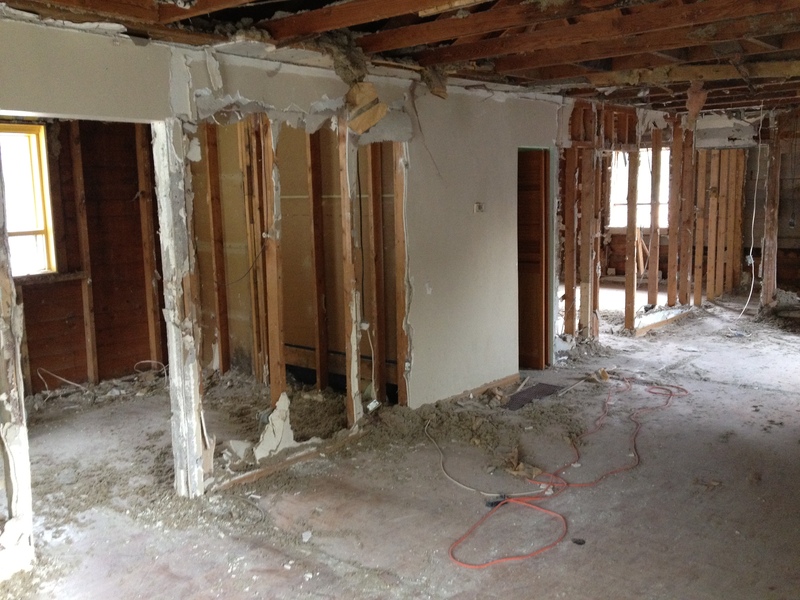 With the exception of the one load bearing wall frame & the main floor bathroom, this house issue is gutted! Ok, we know what you’re thinking…why leave the bathroom? Well as it turns out, after removing several layers of drywall, plaster, mesh, & hardwood floor ceilings (we’ll get to that later), the exterior walls of the house aren’t what we thought they would be structurally. Instead of the cinder block walls we expected to find, we’ve got wood framed walls…very poorly constructed ones that won’t support the second story addition we’re planning. Which means essentially, the whole house needs to come down and be re-built properly – so gutting the bathroom would be a supreme waste of effort! 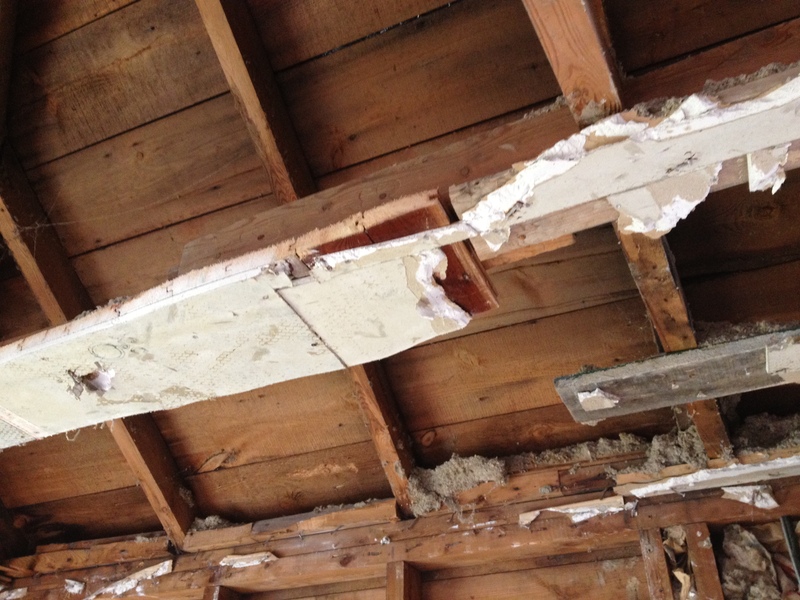 Now back to the hardwood floor ceilings…so far this has been a bit more like an archeological dig than a demo. Lol! It seems the previous owners just added a new layer of material every time they wanted to make an update. In one spot in the basement, we actually uncovered 5 layers of drywall! The kitchen ceiling consisted of a layer of drywall, a layer of mesh and plaster, another layer of drywall, and finally a layer of TONGUE & GROOVE HARDWOOD FLOORING!! Yes. You read correctly. On the ceiling. With all that said, things are moving along. We’re going to have to make some adjustments to the schedule in light of the awesomeness we discovered under the walls. 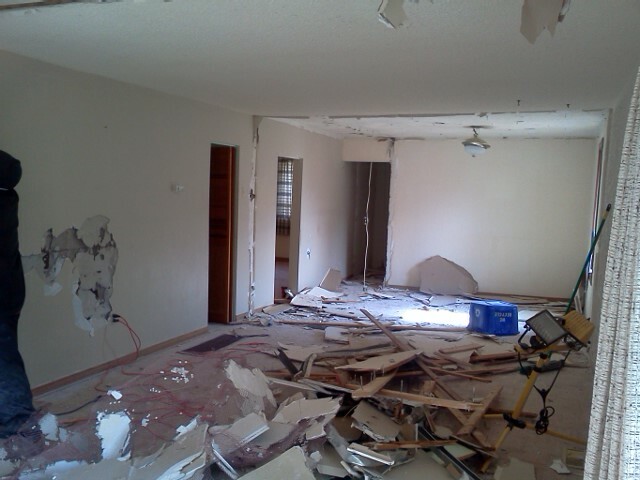 The demo cost has gone up slightly to account for knocking down the 4 exterior walls. Our framing cost is going to increase somewhat since we now need to build 4 new walls. The overall budget however, has enough padding to account for these kinds of hiccups. Thanks HGTV…if you taught us nothing else, you taught us that!